After lengthy discussions with the 2010 Local Organising Committee (LOC), FIFA have finally relented and have opted to allow the vuvuzela and the makarapa to be wielded and worn inside the stadiums during the 2009 Confederations Cup and 2010 World Cup. This last bit is fantastic news. Africa's first hosted world cup can now actually have an African feel that I think might change football fan's paraphernalia world-wide. 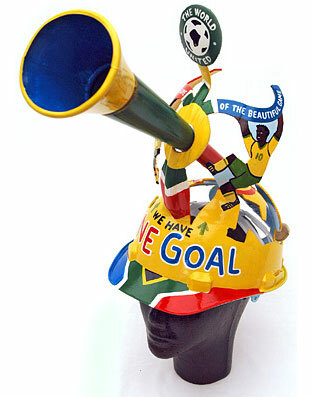 For the uninformed, a vuvuzela is metre-long brightly coloured plastic air horn trumpet, which is blown with great gusto by South African football supporters, giving local games a distinctive vibrancy and atmosphere. A makarapa is a decorated miner's helmet which fans spend hours decorating with the colours and logos of their favourite team. Of course both of these icons of South African football have made their ways into other sports and even into the corporate world. So folks, time to get out those paints and start decorating. You've only got 385 days to get your designs up to scratch (boring and drab colours do not meet the mark). Oh and don't forget the great big sunglasses either. If you're going to do the African thing, you've got to do it right. For the lazy, pre-designed makarapas and vuvuzelas are for sale.